A lifelong athlete, Rachel originally came to the mat in 2002 during her undergrad years at Rochester Institute of Technology because it was an incredible workout. Rachel has a love for travel, and every new place she visits, she tries out the local yoga class. She has practiced with Anusara, Jivamukti, Iyengar, Ashtanga, Svaroopa, and Vinyasa teachers all over the country. After practicing many different styles with many different teachers, she found a love for Vinyasa. Rachel loves being able to blend all of the class styles together. After college, Rachel was working a 9-5, 40hr+ job, and practicing yoga semi-regularly while living in Baltimore, MD, and Dallas, TX. In 2009 she found herself without a job due to the housing crisis, in an unhealthy relationship, and quite lost. She began practicing yoga everyday, and was amazed at the results - a new found love and respect for herself, clarity around her relationship, and a calming effect to her anxiety. As her mind began to shift, Rachel was inspired to share the gift of yoga with others. Originally from upstate NY, Rachel moved to Brooklyn, NY, and received her 200hr certification from Yoga People in January 2011. She has been teaching ever since. In May 2013 Rachel furthered her studies at Integral Yoga Institute and received her 85hr Prenatal Yoga certification. With the inspiration and support of her community, she created Heart Thread Yoga in May 2014. 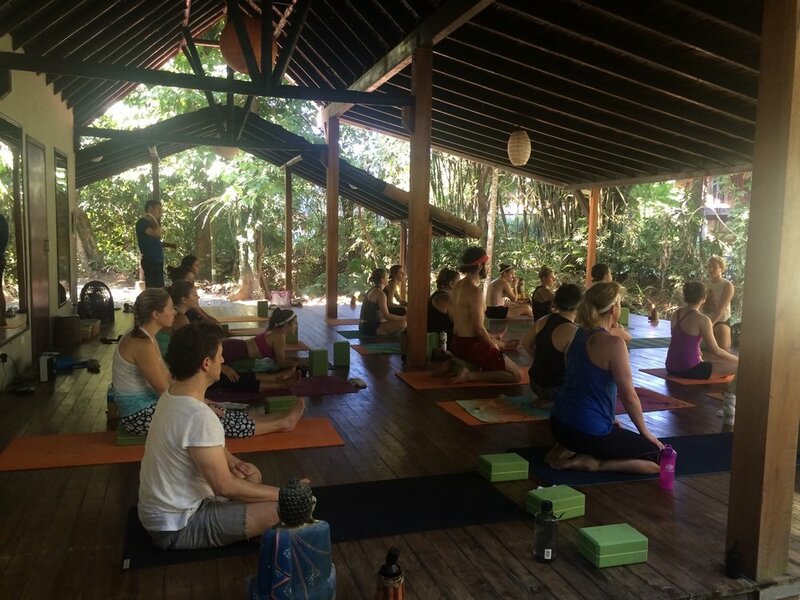 Rachel has led 5 successful yoga retreats, in Costa Rica and the Finger Lakes Wine region, and is super excited to be sharing her love and knowledge of yoga with her Teacher Trainees. Rachel semi-jokes that she is a recovering “type A” personality – before she began practicing yoga, she found her mind racing all of the time, thinking about how to be the best at everything. Rachel grew up as a super overachiever, and it was really nice to come to yoga class and, over time, let the racing mind drop into the background. She started being nicer to people, and to herself. She let herself be vulnerable, and be okay with that. Yoga helps Rachel to understand and recognize that we are all just humans, trying to get by – and we need love and kindness to make that easier. Rachel seeks to create a nurturing environment where students can learn and practice yoga in a caring and accessible way. Her classes are often filled with funny quips, laughter, hard work, and great music. She (immensely!) enjoys creating a space where EVERYONE can feel comfortable practicing yoga asana, with the belief that a balanced body = a balanced life. Laughter, smiles, hugs, dogs – especially her girl Vera! – yoga, gardening, listening to wisdom from older people, wine, dessert, ice cream, pie, friends, THE SUN! sleeping, music festivals, dancing, and lots of water all make her really happy. Check back soon for more teachers and bios!